Drawing a single panel comic about a turtle (Charley) when he was 9, JT knew he wanted to be a cartoonist. That didn’t work out. So, when in 2005, (deep breath) after dropping out of college, joining the US Navy (5 years on the USS Spruance DD 963), marring a great girl, finding the Internet, having 2 Awesome kids, Finding webcomics, leaving the Navy, trying that cartooning thing again with Gecko Nation, and founding NightGig Studios (With Ken Prince) to help other Web Cartoonists, (breath) podcasting was born, he decided he wanted to be heard again and created… (wait for it) … The Gigcast. I first remember drawing for enjoyment when I was about 7 years old. I have always liked drawing space ships and fantasy art. In high school the only classes I could pass with a respectable grade were Art and Creative Writing. After highschool I attended a local tech school hoping to become a comercial artist but between my love for driving fast and my bills for tickets and insurance I decided to step away from school and join the Navy. I spent 2 years onboard the USS Carl Vinson where I met some great friends and designed a few tattoos. Saddly I never thought to take photos of the finished product. After my time inthe Navy was up I came home to Minnesota and worked in construction for a few years. I went back to school for computers because I was always fixing other peopls PC’s for free. Now I get paid to fix and maintain servers.I also love to sculpt and work with wood. I need to get setteled in and actually get a place set up to work on sculpting though so we’ll just call it a work in progress. 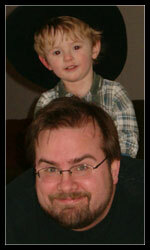 My Wife and I have 2 sons Andrew and Paul. We have also just finished building a house in Wisconsin. We are living on land that has been in Shannons family for over 100 years.I am happy to answer questions if you have any. Michael Moss has been a cartoonist and illustrator since 1999; living and working in sunny San Francisco. Publishing the webcomics Quitting Time, Shadensmilen and the upcoming superhero comic Freedom Watch under the banner of Dung Beetle Comics, a webcomic collective of which heâ€™s a founding member; Michael also writes for the magazine Webcomics Anonymous. Michael also contributes cartoons to the new magazine Modern Seamster and is luck as hell to get to gather news for the weekly podcast the Gigcast produced by the hard rockinâ€™ people at NightGig Studios. 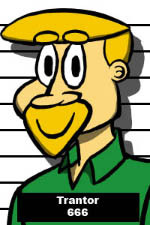 Since 2000, Kevin has spent most of his time drawing and writing web comics. Starting with his five year run on Kota’s World he currently runs Sweatshop Studios on Nightgig and is a frequent contributor on the gigcast. His interests include film making, writing, weird fiction, and weirder people. 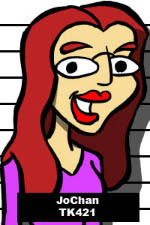 Jo is a graduate student at the University of Kansas. In spite of the fact that this is only her first semester as a teaching assistant, she is quickly living up to the “hopeless academic” stereotype: living alone in a small apartment with an orange tabby and a lot of books. Her actual experience in radio consists of singing along with it and occasionally memorizing call numbers and NPR taglines.A geek from birth,* she was raised on a steady diet of sci-fi, mystery and Python. The first computer owner in her household, she stumbled onto what was to become the World Wide Web in the summer of 1986 via Prodigy. Hobby became obsession became addiction, leading to an unfortunate habit of adopting whatever free web space she came across, regardless of the fact she had no “content” to display. This self-distructive behavior eventually deteriorated into coding on Friday nights. The referred-to film in the picture was actually her first… just guess how old she was when she went to the theater to see it. Corey “fyreHyde” Smith is a student at Southern Illinois University, majoring in Computer Science.He is interested primarily in music, but also has a deep love for comics. Nick Nitro is a man who needs no introduction, cos no one ‘knows’ who he is. ha ha. That was a bad pun. Well, only if you got the fact that he is the weird skit/parody guy of “The Gigcast”, one of the many bits is the now-on-going “Mr Know It All” segments, it’d be funny, wouldn’t it?! Karl “Trantor” Kuras, Karl is an international man of mystery, who can blend in anywhere tall, blonde, blue eyed comic book geeks can be found.Never having worked in the radio format before, he brings his experience in theatrical speech competition to The Gigcast, which coupled with an extremely low brow sense of humor, uninteresting computer gaming anecdotes and a penchant for tirades about which small animals best fit in which human cavities, lends the show an air of sophistication rivaled only be the likes of Socrates, Nietzsche and Howard Stern.And ladies… he’s single.